From the House of Mehron Est. 1927. Our jet black, paintable liquid makeup delivers a high shine vinyl-like finish giving you an intense look that lasts. 1927’s unique water and smudge resistant formula retains its glossy shine and lets you create endless textures and designs for face and body. Includes a professional two-piece brush that’s perfect for creating the finest details. Our ultra long-wearing liquid vinyl can be used for the most precise eye-lining detail and for elaborate body painting creations. Let your creativity go wild, the options are infinite! Stored in a great retro .5 oz. ink well bottle! Shake well. Paint on face or body, be creative! Remove with Mehron’s Bared ™ Makeup Remover & Cleanser and gently peel off. Water/Aqua/Eau, Acrylates/Ethylhexyl Acrylate Copolymer, Sodium Acrylate/Sodium Acryloyldimethyl Taurate Copolymer, Aminomethyl Propanol, Tocopheryl Acetate (Vitamin E), Phenoxyethanol, Ethylhexylglycerin. May Contain [+/- CI 77499 (Iron Oxides)]. 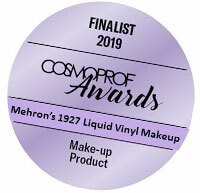 Click the button below to add the 1927 Liquid Vinyl™ Makeup to your wish list.